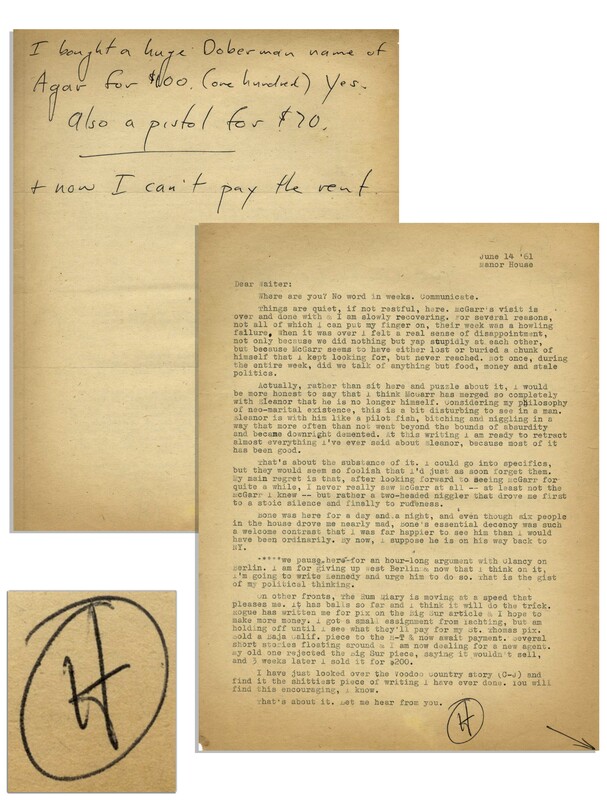 Hunter S. Thompson letter signed with intriguing and thoughtful content about a change that he noticed in a high school friend. 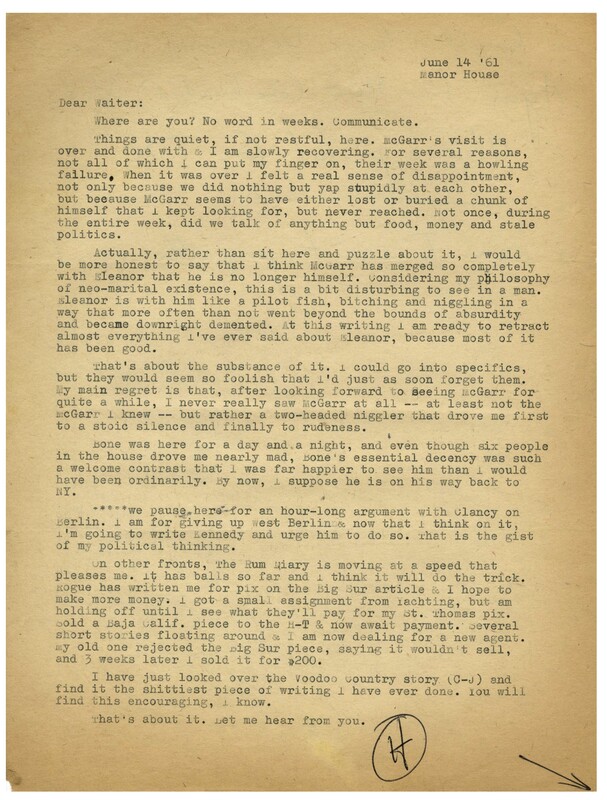 Dated 14 June 1961 from ''Manor House'' in Big Sur, letter to another high school friend Paul Semonin reads in part, ''...Things are quiet, if not restful, here. [Eugene] McGarr's visit is over and done with & I am slowly recovering. For several reasons, not all of which I can put my finger on, their week was a howling failure. When it was over I felt a real sense of disappointment, not only because we did nothing but yap stupidly at each other, but because McGarr seem to have either lost or buried a chunk of himself that I kept looking for, but never reached. Not once, during the entire week, did we talk of anything but food, money and stale politics. Actually, rather than sit her and puzzle about it, I would be more honest to say that I think McGarr has merged so completely with Eleanor that he is no longer himself. Considering my philosophy of neo-marital existence, this is a bit disturbing to see in a man. Eleanor is with him like a pilot fish, bitching and niggling in a way that more often than not went beyond the bounds of absurdity and became downright demented. At this writing I am ready to retract almost everything I've ever said about Eleanor, because most of it has been good. 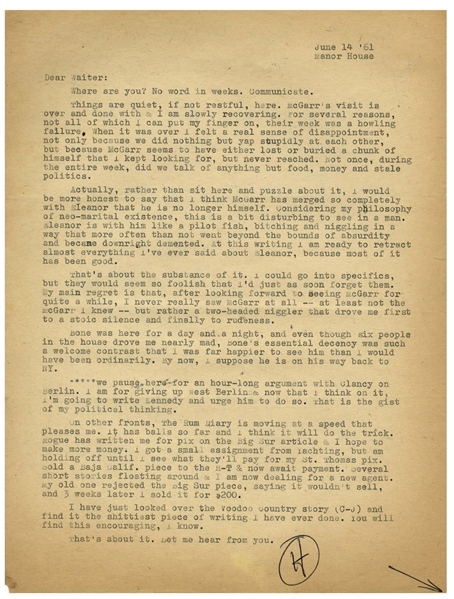 Thompson then writes about ''The Rum Diary'' and an argument he had regarding John F. Kennedy's Berlin policy, ''I am for giving up west Berlin & now that I think on it, I'm going to write Kennedy and urge him to do so. That is the gist of my political thinking. On other fronts, the Rum Diary is moving at a speed that pleases me. It has balls so far and I think it will do the trick. Rogue has written me for pix on the Big Sur article & I hope to make more money...I am now dealing for a new agent. My old one rejected the Big Sur piece, saying it wouldn't sell, and 3 weeks later I sold it for $200. / I have just looked over the Voodoo Country story [''Louisvillian in Voodoo Country'']...and find it the shittiest piece of writing I have ever done. You will find this encouraging, I know...[signed] H''. 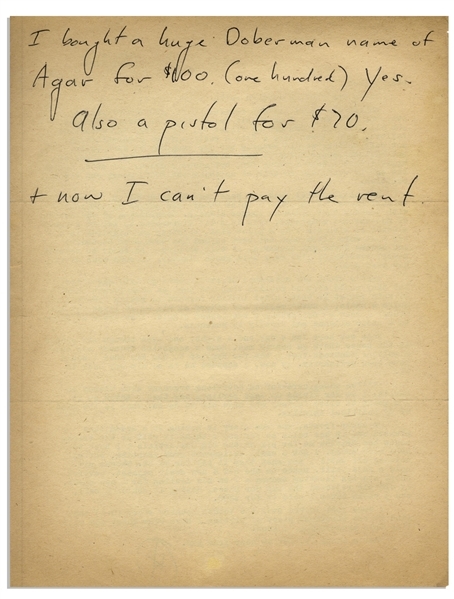 Thompson then adds an autograph note on the verso, ''I bought a huge Doberman name of Agar for $100 (one hundred) Yes. 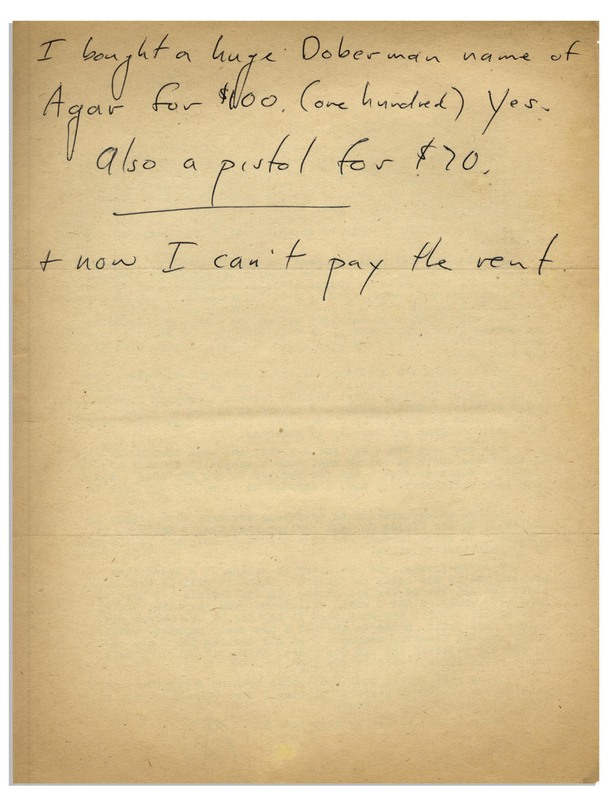 Also a pistol for $70 & now I can't pay the rent.'' Two page letter on a single sheet measures 8.5'' x 11''. Toning and chip to side, overall very good condition.